Hey everyone, I know it has been pretty quiet in our camp lately, but for good reason. We have been splitting time between preparing for our Alligator Gar trip to Texas, and chasing C-class Carp around the Central Virginia area. Both of which have just about drained the life out of us. For more details on the Gator Gar trip head over to our podcast section and check out what we have going on, as for now, we’ll focus on the Carp. Grant and I have been attempting to score a citation Carp for a few years now and it has proved to be one of the more challenging fish on our hit list. Thick fish, built for power, they are relentless fighters that will give any angler a run for his money. With a fight that resembles a Redfish in the salt, it’s one of the strongest fish in freshwater and they certainly reward any angler that puts in the time to catch one. Carp aren’t necessarily hard to find by any means, although, finding large carp that are targetable is a challenge in itself. 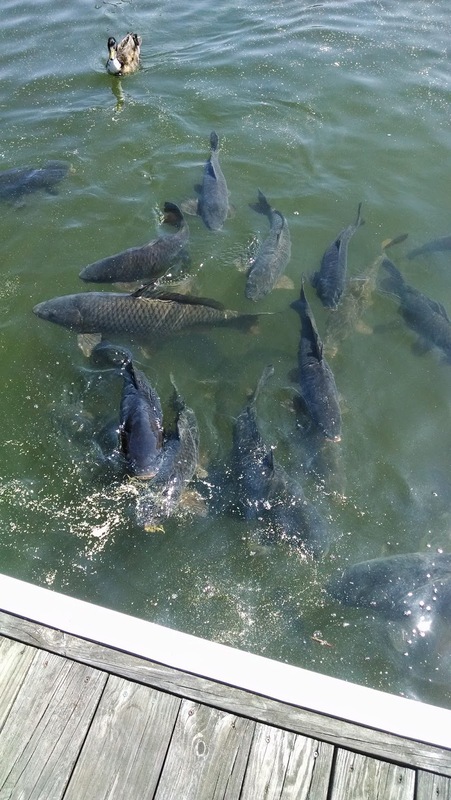 Central Virginia is home to a healthy population of average size fish. You don’t have to drive too far if you’re just looking to catch one…. But average hasn’t ever really sat well with us, that being said, we pounded the pavement trying to find a big girl. The species in general is difficult to fish for right off the bat. They’re hard to hook and the larger individuals tend to be very skittish, thus leading us to employ a wide variety of rigs and tactics. Even when you hook one there’s no guarantee that you’ll ever lay eyes on what’s at the end of your line; they have a smooth, fatty mouth, which if strained too much, will tear, causing the hook to pull free. If that wasn’t bad enough, you can’t exactly just target a large fish; you have to find a pod that has a larger average size, increasing your chances at a big fish. If you just target any old school that swims you’ll end up weeding through a lot of smaller fish and that is no bueno. Our efforts began on the James River but were quickly redirected to Lake Anna after I witnessed a few massive specimens while on a Largemouth outing with my buddy Jack Meriweather. The fish there were impressive and in good number. The majority of them were clean, almost never touched by man, displaying nice fat guts like most lake fish do. After a few days of planning we hit the road back up to Lake Anna. We were rewarded with a few nice fish here and there, but the overall size of the lake and the amount of human traffic the area received proved to be too frustrating when trying to pattern certain schools. We grew tired of burning up the gas and spending so much time on the road so we came back to Richmond to begin a new scouting campaign. One of the main reasons the James River is so much fun to fish here in Richmond is because the water gets crystal clear this time of year, making the stalking of fish much, much easier. It didn’t take too long before we scouted some nice, chunky fish close to home. We jumped at the opportunity of good fish and quickly hit the water. After chumming the school up with oatmeal balls on my first trip out I was immediately rewarded with two fish right out of the gate. 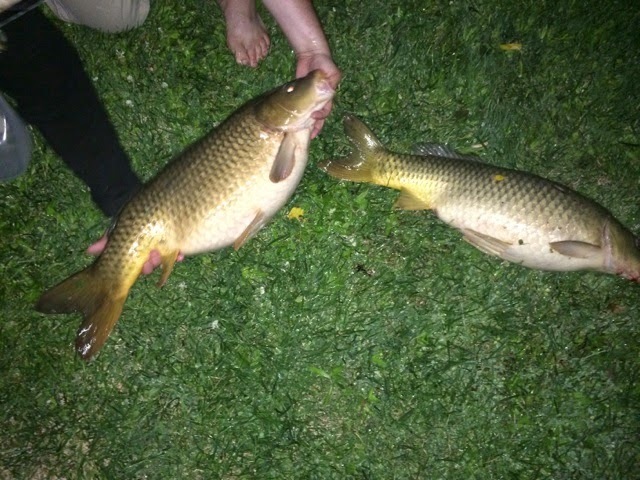 The largest being a 32 inch 18 pound hog of a carp. After the first successful trip we regrouped and hit it again a few days later. This time we really got them stirred up. After chumming for about 30 minutes we soon had around 20-30 fish feeding directly in front of us. As the sun was going down we managed to get a higher vantage point and noticed that most of the fish we had rooting around in front of us were heavy..... obese….. absolutely, discustingly, bursting at the seams, fat! It may not be very popular in the dating scene, but when you’re talking blubbering buglemouths, you can’t get any better than a big old golden lady! 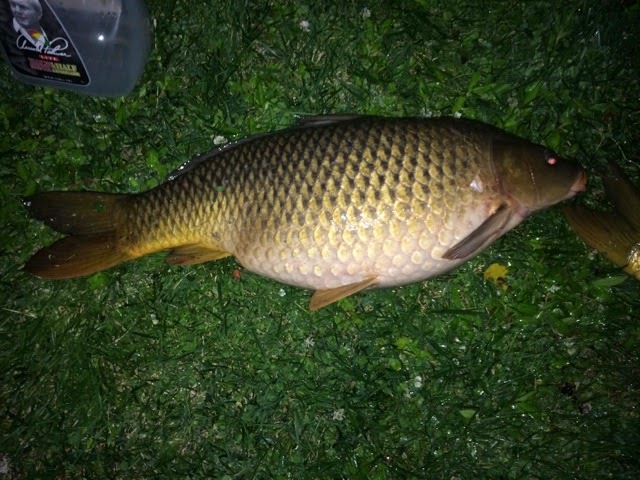 In anticlimactic fashion, the first fish out of the gate wasn’t all that big, a cookie cutter fish of about 10 pounds. That quickly changed, we had two reels scream simultaneously, prompting us to do a little dancing around to avoid getting tangled. We landed the first one relatively quickly but the second one did a little back talking. I fought her for few more minutes or so, realizing it wasn’t just another average fish, it was one of the fatties! We got the net ready and heaved her to shore, immediately I broke out in laughter at the sheer shape of this fish. She was a fish of decent length, about 30 inches, but the girth that she had just made her look silly, sort of the shape of a soup can or a barrel. The fish weight a stout 22 pounds 4 ounces, which by Virginia specifications is a citation! 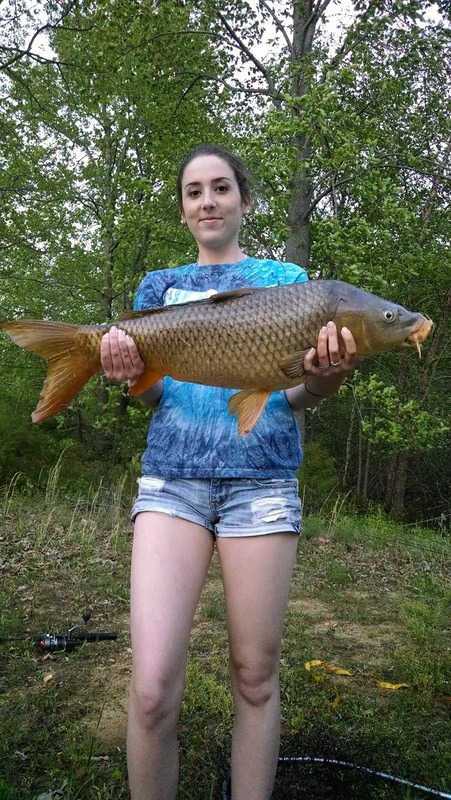 She wasn’t my longest carp ever, but she was definitely my heaviest. I never expected to get a citation on weight alone, that’s a difficult task for any species in the James (other than blue catfish). After a long pursuit of a formidable opponent, I will turn in my paperwork with a profound sense of accomplishment. Out of all the 25 Virginia citation eligible species, some a lot harder to conquer than others, the carp tends to be on the harder end of the spectrum for most fishermen, including myself. 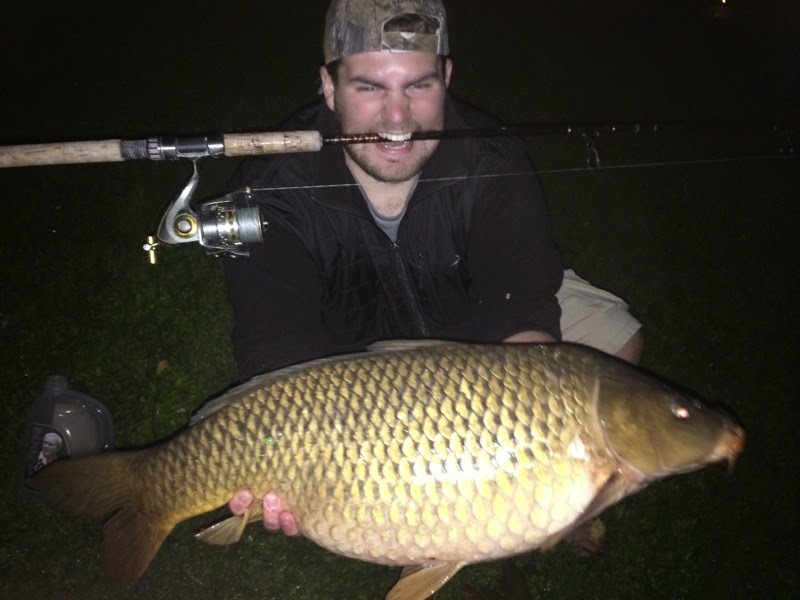 Most anglers come upon a citation carp as a product of by-catch. Not many people in this state target them regularly enough to learn the ins and outs of the species to the point where they can catch fish frequently, and big fish at that. 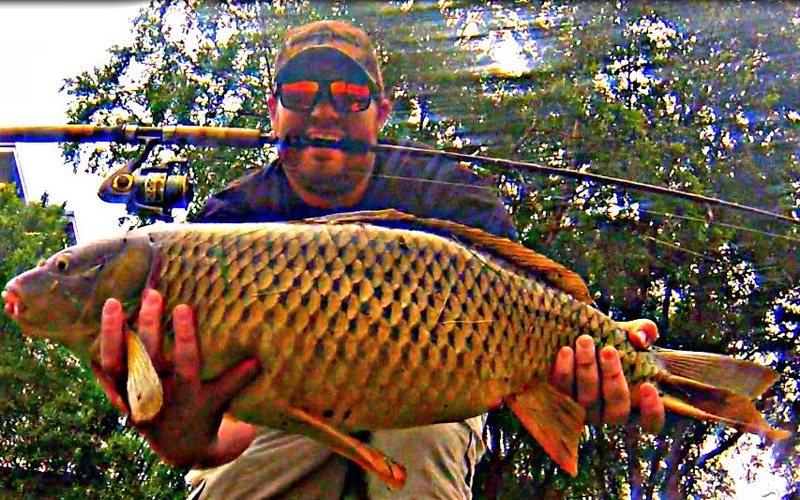 If you guys would like to learn how to be successful at catching a Carp yourself, feel free to check out the rest of the website where we have a podcast on Carp fishing as well as a section devoted to the species in our Tips and Tactics page. That’s another species off of our freshwater trophy hit list and I’d be lying if I said I wasn’t relieved. It’s time to move on to a new species and a whole new set of challenges. I hope you guys enjoyed the read and can make use of the information on fishing for Carp we have provided on the site. Thanks for viewing!